What Is At The End of Zzyzx Road? Upper and Lower Mesa Falls are breathtaking waterfalls that rival those of the nearby Yellowstone National Park. Located along the Henrys Fork River in the Grand Targhee Forest, this is a short and easy must-see “hike” on the way to the western Yellowstone entrance from Idaho. The water of these falls cascades over remnants of an ancient volcanic super-eruption that spewed ash over much of the current US. The ash has since solidified into stone and is over a million years old in some places along the river. The visitor’s center provides additional information about the history of the falls and of Henry’s Fork river if you’re interested in learning more about the area. 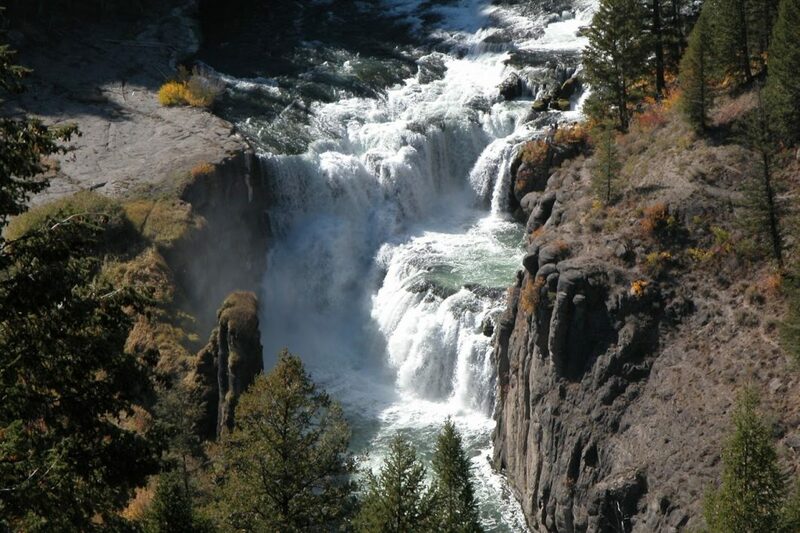 The Upper Falls (120ft) are more picturesque and more often seen in pictures. These falls are broader in width and pour into a canyon surrounded by tall moss covered walls. The mist from the falls have created a unique environment for vegetation on the surrounding cliffs and will often create rainbows on sunny days between 9:00 am and 1:00 pm. The viewing platform allows for multiple views of the Upper Falls, from above, right next to them, and then below looking back up. The Lower Falls (114ft) are less impressive in my opinion, but still beautiful. The Lower Falls go through a much more narrow area and are more of a series of very large rapids than one big towering waterfall. You also aren’t able to get right beside the Lower Falls like you can with the Upper Falls since they are much deeper into the canyon. The best view of the Lower Falls you can get is above looking down on top of them. On the way to West Yellowstone from Idaho on Hwy 20, turn east onto Hwy 47 in Ashton. Continue for about 15 miles through the Grand Targhee Forest. The Lower Mesa Falls will be first on your left and is about 0.7 miles before you get to the turn off for Upper Mesa Falls and visitors center. You can stop here to look at the Lower Falls or continue on to the Visitor’s Center and Upper Falls and then walk back down to the Lower Falls later on once you’ve parked. You’ll follow the scenic byway until you reach the turnoff for Upper Mesa Falls, which is well marked. Drive down to the parking area just outside of the Visitor’s center. Parking is $5 and there’s a self-serve pay station in the lot. It’s mostly based on the honor system as there aren’t many people around monitoring. From the lot, you’ll head towards the Visitor’s center and follow the signs with to get to the viewing platform above the Upper Falls. The scenic byway is closed during the winter and is groomed for snowmobiling and Nordic skiing, so you can’t visit in the winter unless you want to ski there. Summer is the best time to visit as most of the snow has melted and the waterfalls will be a their peaks with gallons of rushing water cascading over them. The two waterfalls are within a mile of each other and walk around the waterfalls is very easy and simple – no real hiking involved. The entire path is paved and there are railings around the viewing platforms that run along the side of the falls. It’s good for people of all ages and all fitness levels, though there are some stairs. Plan to spend maybe an hour to 1.5hrs at the falls. That is if you want to walk the full viewing platform, take in the views, and visit both falls. It shouldn’t take much more time than that to see everything. A fit person could easily walk the entire platform without stopping in less than 15mins. Even during the busy summer months when Yellowstone is packed, Mesa Falls usually has relatively low crowds since is out of the way and a bit unknown. A passion for travel, a lust for adventure, and a commitment to creating a more eco-friendly world. I want see the world with panache! Which to me means from as many campgrounds and mountain tops as I can. And for you, I bring back my spoils of war: insight and advice on how get the most out of your travels to some of the most beautiful places in the world while still being eco-friendly. We love discovering new amazing place and outdoor brands and sharing them with our readers! If you're interested in working with one of our explores, please get in touch! Some of the link on some of our posts are affiliate links. This means that if you make a purchase from clicking on one of our links, we will get a small amount of compensation from the company for referring you. This is no extra cost to you and we only recommend products that we have tried and absolutely love! A group of friends who love to explore and love our planet. Earth is our one and only home, let's take care of and enjoy it! Questions about anything you see here? Drop us a line, we're happy to help!